Gather all the materials you need for this project before you begin and use newspaper or another similar item to protect your work area. Mix the red and yellow paint to form an orange color. The ratio of the yellow paint to the red paint is 2:1. You can skip this process if you already have an orange acrylic paint. Paint the outer wall of the small wide-mouth jar. Paint in one direction so it looks better when it dries. Set the jar aside and let it dry for an hour. Once the jar is dry, paint it a second time. Set the jar aside and let it dry for another hour. If you like how it looks, you can move on to step 8, if not give it a third coat of paint. Set the jar aside again and let it dry for another hour. Once the paint is dry, draw a pair of big eyes on the jar using a black permanent marker. Create a pupil in the middle and a nose just below the eyes. Draw a mouth just below the nose of the jar pumpkin using the black permanent marker. You can draw teeth if you want, but it is not necessary. Set the jar aside again and let the permanent marker dry. 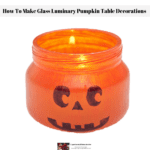 Once the marker is dry, place the tealight candle inside the pumpkin glass luminary. Light the pumpkin luminary using a lighter or if you are using LED tealight candles then turn the switch on. Your glass luminary pumpkin table decoration is now ready to display.